Health and Sports Day is a national holiday in Japan held annually on the second Monday in October. It commemorates the opening of the 1964 Summer Olympics being held in Tokyo, and exists to promote sports and an active lifestyle. 体育の日たいくのひ・Health and Sports Day was first held on the 10th of October 1966 to commemorate the opening of the 1964 Tokyo Olympic Games. It was moved to the second Monday in １０月じゅうがつ・October in 2000 in accordance with Japan’s Happy Monday Systemハッピーマンデー制度・はっぴーまんでーせいど (a law designed to create 3-day weekends for people who usually have a 5-day work week). 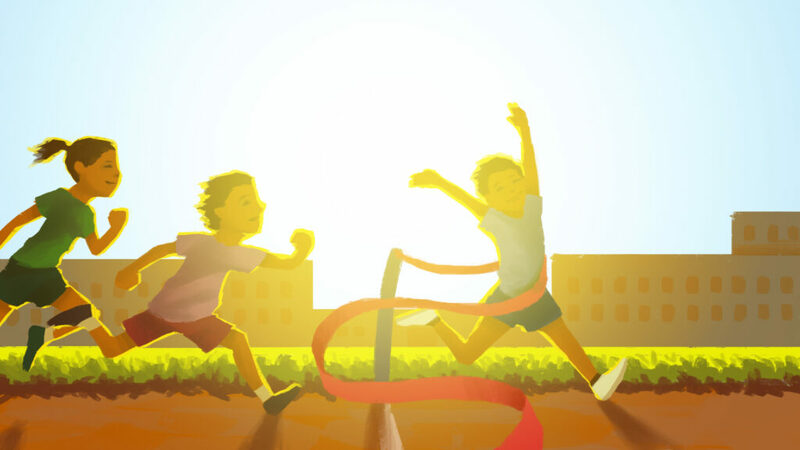 On this day, many 学校がっこう・schools, businesses, and government offices observe 体育の日たいくのひ・Health and Sports Day to promote exercise and a healthy life style, by holding field days, known as 運動会うんどうかい・undokai. These field days resemble miniature Olympic games, complete with a torch carrying and lighting ceremonies and featuring many Olympic events such as the shot put, 100m sprint, and 4 by 100m relay. They also include many non-Olympic events like tug-of-war, obstacle course relays, ball tosses and crazy events dreamed up by the planners and participants themselves. For example, the 3rd year junior high school boys at a school in 埼玉県さいたまけん・Saitama Prefecture set a world record by building a human wall 5 or 6 people high and then walking forward about 100m! The best this author has seen was a group of elementary school 3rd and 4th graders dancing, striking dramatic poses and building human towers and pyramids to the musical cues of the Mission Impossible theme while smoke bombs were set off with strategic timing to enhance the effect. The creativity of some of these evens is truly amazing.